Who is Ready to start Winning Tennis, Using the All-Natural Power of Hypnosis? You are standing on the court. It’s a beautiful day with a clear, blue sky. You feel a slight breeze on your body. You are calm and focused. You are looking over the net, picking the spot where you want the ball to land. You toss the ball into the air confidently. You are completely in control as you make contact with the ball. You watch the ball sail across the net and land in that perfect spot. ACE !!! 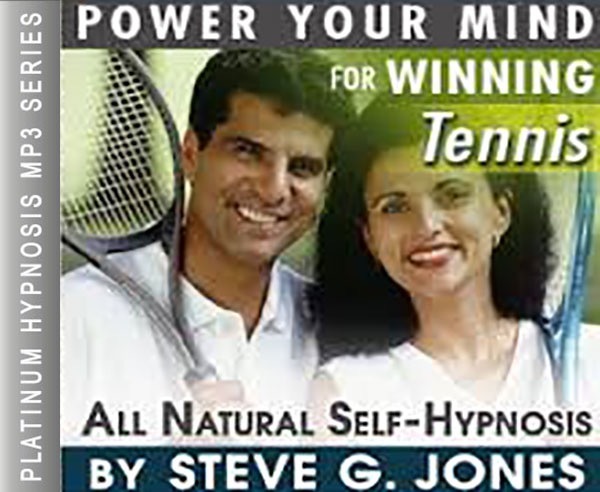 It’s easier than you think with the Winning Tennis Hypnosis MP3. Imagine having the power to be as successful as you’ve dreamed!!! Hypnosis is a powerful tool in putting your mind in the right place to improve your game in any sport, including tennis. Psyching yourself up for a good competition is as much a part of the game of tennis as practicing your serve and backhand. The Winning Tennis Hypnosis MP3 download is effective in creating a winning image in your mind and in removing mental barriers to playing your best match.The beginning stages of hypnosis can be compared to getting your equipment ready. In the initial stage you are coached into a very peaceful and relaxed state of mind. Everything is ready then to be put to good use. The next stage takes you to a deeper level of relaxation and sets the stage for a spoken script to be introduced. This script contains all of the messages that help you visualize yourself making the shots and using good form and technique to win the game. Over the course of 3 weeks the script is played each night as you go to sleep. Each night you will be brought through the stages of relaxation, a deepening of the relaxed state, the script that specifically focuses on your tennis game and how to improve it, then slowly the mind will be prompted to not over analyze what you have been listening to, so that the subconscious mind can retain and use the information. Finally, you will be prompted to go into a restful sleep and awake the next morning refreshed. Steve G. Jones, a clinical hypnotherapist, has created the Winning Tennis Hypnosis MP3 audio. After listening to the program for 21 nights, you can experience an improvement in your game and have a change in mental attitude that earns you those wins. Steve G. Jones, Ed.D., Clinical Hypnotherapist, charges $1,500 for a custom recording and $25,000 for a one-hour private hypnotherapy session at his office. But you can get all the benefits for this low price. Simply listen to the Winning Tennis Hypnosis MP3 session every night as you go to bed for three weeks and feel the changes happening in your life. You will feel more empowered, more in touch with your true self, and you will truly know that your goals are within your reach. p>This is the same hypnotic technique he uses with busy professionals, Hollywood actors, and people like you who are ready for a positive change NOW! Tomorrow, during the warm-up of a match, you are analyzing your opponents’ age, size, movement skills, and racket skills. You know that you can figure out a way to win. You are a smart tennis player. And you practice and you know how to beat different opponents. Enjoy hitting the ball and being out on the court. As a match develops your feet get quicker, your body becomes weightless. You move about the court almost as if you are suspended in a cloud. You are almost hoping for long rallies. Because that is where the enjoyment comes from the game is just hitting the ball. And if the opponent happens to make a mistake and the ball doesn’t come back, it’s almost as if you say “darn” I wish the ball had come back.” Instead you won the point and you move on. Your opponents are going to be people that you enjoy after the match; chitchat on changeovers will not help you play better. On changeovers stay focused, sitting in your chair. Looking at your racket, looking at your strings, relaxing, and tightening up any muscles that feel tight and then relaxing them. It’s so awesome to stay within yourself and picture yourself playing perfect tennis. You are pretending in a way that this may be your last chance to play this person. So you want them to respect you. And they will respect you because of your competitiveness, because of your efforts because every point you give it your all. You almost want to display that after the match, your opponent will say, “Wow, I can’t believe how many balls you got back.” You want to display to your opponent that they can’t believe that the ball keeps coming back. And back. You want to develop a feeling inside of them that no point is ever going to be lost by you. That you are going to get to every ball, you will chase down every ball and then recover. There is one ball on the tennis court and you have it and so when it is your turn to hit all your attention will go into making a solid contact point. You are going to know when to hit the winning shot. You are going to know intuitively when to play defensively and when to lob. You know in advance that you are going to be humble in victory and stoic in defeat. After a loss you will analyze particular parts of your game non judgmentally and know that you will work on those areas this week and at the next match you will have a chance again to overcome those areas and play great tennis. You already know in advance that you are going to apply what you’ve learned at clinic this week. You can’t always control how well you are going to feel tomorrow. But you do know that you can control your emotions. And you can also control how you treat your partner and how you can treat yourself. Those are parameters you can control. You love to see your opponent run and chase down balls, you will know when to hit behind them you will know when to hit at them. You’ll know how to run them. You’ll know that moving an opponent forward and backwards there are 39 feet between the baseline and the net. It’s a great distance to move an opponent so you’ll know when to hit short and when to hit deep. In doubles, the goal is to separate your opponents and hit in between them. Tomorrow is a day to enjoy tennis. Your self worth and existence on earth is not based on winning or losing this tennis match. You are just happy to have a chance to play. You are away from all your other stresses, your job, and your children. This is your chance to have fun. You know that you can win. You have practiced and have hit this shot over and over. Practice is simply a way to hit the ball over and over again so that when it comes time to hit that same shot in a game you just recall that you’ve done it before and you can do it again. On the serve, your hitting arm is loose and your wrist is loose. Your toss is in the same spot every time. Your eyes look up to the contact point. Your arm and racket reach up to the contact point and you watch yourself make contact with the ball. And it is almost as though when you hit the ball, you have hit a missile on its way. It is going to its attended target. There is no way it is going to miss. It is going to go to that particular part of the service box that you have set up in advance. If you are serving a volleying you are going to toss in front and almost chase the ball to the net with a well-timed split step just before your opponent returns the ball. If you are serving and staying back, you will serve, and chances are you will be slightly in front of the baseline you’ll know that you won’t want to be stuck there so your feet will be in motion and You’ll be looking for the depth of your opponents return so you will know to go forward or backward. When returning a serve, this is another shot that you can control because you have time to think about it before it happens. You can visualize your target ahead of time. Visualize a hit down a line. Visualize a hit across court. Visualize a lob over your opponent. Will you keep the ball low to an incoming servers feet? You will pick this target ahead of time. You will have confidence. And execute your shot to perfection. Your forehand groundstroke today has a short back swing has a beautiful fluid contact point and follow through. Your head stays still. Your forehand is perhaps your strength. So you are going to play the points, hoping and knowing when to release a harder hit forehand for a winning shot. Your backhand is just as strong as your forehand. Your backhand contact point is in front. You see the ball hit the strings. On the volley, as you approach the net, your feet are quick. Your feet get you into position to hit a great volley. The ball on the volley is hit with your feet; the hand does very little. A slight squeeze of the hand, right exactly at the moment of impact, that pop, is what gives the ball velocity as well as you leaning forward going toward your hit. You love your overhead. Now when the ball goes up, you say “oh yes” because overheads are your winning shots. Especially when you are in position. You place the overhead at the closest person on the other side of the net. If it’s a defensive overhead, you are going to reach and get the ball back and rebuild the point. On an approach shot your feet are fluid, your head is still. Your follow through extends out to your target area. Then, before your opponent hits the ball, you split step. You are the better player today because you have prepared for this match. You are the better player today because you enjoy tennis more than your opponent. You are the better player tomorrow because you know that time tomorrow on the court is a blessing and a gift and is one more way to have fun with tennis. You are going to play one point at a time. You are going to take time between points. You are going to stress a solid contact point, you are not going to worry about past errors and you are not going to stress about future scores. You are simply going to play one point at a time. Your head is going to stay down you are going to control your eyes, because where your eyes go, your mind goes. So your eyes stay down between points. You are going to reduce your unforced errors tomorrow. You know that your opponent is capable of making mistakes you know that they have weakness. When errors happen they immediately leave your system. You visualize and feel the perfect shot within your body. When you hit winning shots you will remember what they felt like and sounded like. In between points you will replay the same sounds and feelings. Playing in the zone is very chemically oriented so you will want to think ahead of time what it feels like to hit wonderful great shots. Replaying them between points is a great way to get inside the zone. Using tactics you learned in practice will be applied today. Keeping your eyes on the ball. Saying, “Bounce hit” every time the ball bounces on the court, on both sides of the net. And saying, “hit” when you or your opponent hits the ball it is a great way for you to focus on the ball. When the point ends you stand tall and confident your racket goes to your non-hitting hand. You take your time and prepare for the next point. If you are serving you can visualize the perfect serve. If you are returning the serve you can visualize the perfect return. In the middle of the point you are going to exhale as you make contact with the ball you are going to trust your swing you are going to trust that the ball is going to go in. Your body weight is going to go forward you are going to recover and you are going to expect the ball to come back and get ready for the next shot. You know that tomorrow, in a competitive match, you can play your best tennis. This is why you play tennis because when it is important it seems to bring out the best in you. And even if at first the butterflies are there, you know that soon they will go away that soon you will be enjoying the match and soon you will be enjoying the battlethat has been placed before you. You feel balanced on the court after every shot. You recover to the perfect position and you are balanced. You know in advance that your head is a very important part to each hit. So it stays still. Your eye tracking skills will be superior tomorrow. You can see the lettering on the ball and the fuzz. You can see the ball leave your opponents racket and know immediately which way to turn your shoulders. When the ball is 3 feet off your opponents strings you already know where its going, prepare and move to the next shot. And after you hit, you are going to move, you are going to hit and follow through with a confident hit and a purposeful hit and then recover quickly. Again, tomorrow is the day you are going to play great tennis. Tomorrow is your day to see the ball bigger than it has ever been seen. Tomorrow is your day to make contact with the ball better than you ever have before. Tomorrow is your day to superbly enjoy the game of tennis. To hit each ball with confidence, enjoyment, pleasure. Knowing that your self worth is not based on a win loss record. But simply on how well you hit the ball today, how well did I communicate with my partner today. You are a great communicator and tennis player. Your swings are fluid you have short back swings, contact with the ball is always made out in front. Your bodyweight is going forward. You have an incredible ability to keep your head still during the impact point as the ball hits the strings. You have an incredible ability to bring out the best in yourself and in your partner. You are going to love this match regardless of whether you win or lose. Losing is just one more way to say that you ran out of time to figure out a way to win. If you are playing well and you get ahead, again, play one point at a time staying in the moment not thinking ahead. Never become over confident just display confidence within yourself and to your opponents. Play each point to your fullest potential. You hit the sweet spot so many times on your racket and you love the feeling. As the ball comes toward you almost anticipate knowing in advance that you are going to hit the sweet spot on the racket. It’s going to pop you are going to hear and feel the sound of a great contact point and know in advance that the ball is going to go where you want it to go. Then, after that great shot, you are going to be balanced and expect and hope that the ball comes back so that you can do it again because the great pleasures of tennis are hitting the ball over and over again. Opponents, whether long time friends or new acquaintances are people to enjoy after the match is completed. During the match is when you are trying to bring out your best. This is most often done when you stay inside yourself and when you have positive conversations with yourself or your partner. Save the chitchat for after the match. Save the compliments for after the match. Don’t over compliment your opponents during the match. Accept and believe when your opponents give you compliments. Let your racket do the talking. Practice has been wonderful this week. Now at this match you are going to apply that practice and how you felt right now in this match. You see yourself playing beautifully and fluidly and moving about effortlessly and contacting the ball perfectly. You have played long enough to know how to hit the ball and where to hit the ball. Now it’s time to enjoy hitting the ball. You will be amazed by how much you will improve with this self-hypnosis session on improving your tennis! So much of playing tennis is mental and many times it is difficult to get rid of the mental road blocks that have been established. Not any more. With hypnotherapy, you can improve your tennis game with ease. As you go to bed at night, you will listen to this relaxing hypnosis session. It will allow you to visualize yourself playing tennis effortlessly and perfectly. It will give you the confidence you need to play to the best of your ability. It will improve your game by targeting your focus. You will learn from every mistake you make and this helps your game. We suggest you listen to this Winning Tennis Hypnosis MP3 recording every night before going to bed for 21 nights in a row. You will begin to see changes in your tennis ability in as soon as the first day! The Winning Tennis Hypnosis MP3 program will give you the skill set you need to beat your opponent and improve your game of tennis!